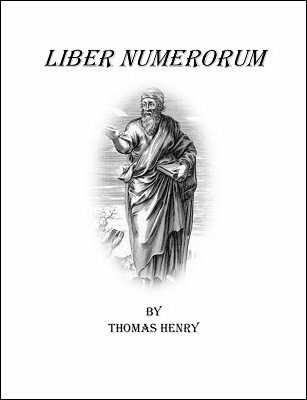 Liber Numerorum is Thomas Henry's newest and largest collection yet of mental magic methods and effects, accumulated from over twenty years of privately kept notebooks. Here at last is the long-awaited follow-up to Thomas Henry's Hidden Numerical Forces . In this new volume, Liber Numerorum , you will find a broad range of mental magic material, from methods to complete routines, from dead serious to whimsical pieces guaranteed to generate wonder and smiles simultaneously. Yes, his quirky humor comes through from time to time within this engaging handbook of psychic entertainment. While mathematics may lie behind many of the pieces, the author has carefully thought them through to push that fact far behind the curtains, allowing the entertainment value to shine in the spotlight. Themes explored include precognition, clairvoyance and telepathy using number cards, dice, gambling tokens, numerology charts, pendulums, astrology charms and much more. No difficult sleights are assumed throughout. As a bonus to the 230 pages of this fun-to-read guide, you'll also receive 68 additional PDF pages of artwork and templates for making all the props described yourself. Moreover, the text is embellished with extensive footnotes documenting the history of all ideas, and features a very complete bibliography, glossary, extensive index, and five appendices treating hints and tips for crafting the various gimmicks. All this, and over 150 photos and illustrations. 1st edition 2019, 230 pages + print ready templates.